Jewelry can be a high-dollar and high-profit item to sell on eBay. Before taking fine jewelry to your neighborhood pawn shop, a "We Buy Gold" shop or trying to sell it on Craigslist, consider selling it on eBay. You will have eBay and Paypal involved in the transaction and have recourse if something goes wrong. Costume jewelry can also be a lucrative item to sell on eBay. Learn how to sell both fine and costume jewelry on eBay the right way. Fine jewelry costs hundreds or even thousands of dollars at full retail and can bring some needed extra cash if you have to sell something to pay for a life crisis. eBay can be a suitable venue to sell fine jewelry and get the best price. Maybe you have recently gone through a divorce and have no desire to keep your wedding band and engagement ring. Or maybe you were engaged and it fell through and you have no desire to keep the ring. Or perhaps a relative has passed away and you have inherited their jewelry. Regardless of how you acquired fine jewelry, eBay can help you get the most money for it when you want to sell. Costume jewelry is made with inferior materials. It is also known as junk jewelry, trinkets, or fashion jewelry. It is mostly made of cheaper metals including brass, nickel, acrylic, plastic, gold plating, pewter, glass, and a variety of other man-made metals and materials. Costume jewelry came about during World War I as fine metals were needed for the war effort. Creative designers began making jewelry out of all sorts of materials that aren't made anymore like bakelite and lucite. Vintage costume jewelry, depending on when it was made and the material it is made of, can be quite valuable. So don't assume that because your aunt left you a trunk full of funny looking jewelry from post-WWII, it isn't valuable. Fine jewelry is valuable because of what it is made of, where vintage costume jewelry is valuable because of the history it holds. It is often hard to tell exactly how much a piece of jewelry is worth. Which is why jewelry appraisers exist. 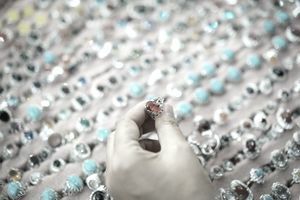 If you are planning to sell fine jewelry, it is wise to get an appraisal. The appraisal can cost will vary from jeweler to jeweler, and depending on where you live. Get estimates before committing to pay for an appraisal. Once the item has been appraised and you have the paperwork, you will want to show the appraisal on the eBay listing for proof of the value of the item. To show on the eBay listing that an insurance company agrees with the appraisal. To show that you have done your due diligence finding out the value of the item and insuring it. To help you look more credible against your competitors on eBay. To protect the jewelry until it has been sold and is out of your possession. Jewelry is a very competitive category on eBay, so you want to take extra steps to outshine your competition. Take closeup photos of your item so the buyer knows exactly what they are getting. Show scanned copies of both the appraisal and the insurance policy. Include information about secure shipping and that the package will be insured up to the full value of the item. Answer questions quickly and professionally. To minimize the chances of it getting lost. Anything in a small package is more susceptible to being lost in the shuffle of the postal system. To minimize the chance of theft. Small packages that look like jewelry can easily be stolen. Take your time when learning to sell jewelry on eBay. It is a specialized niche with brutal competition. It may be in your best interests to hire an eBay consignment seller to handle it for you.